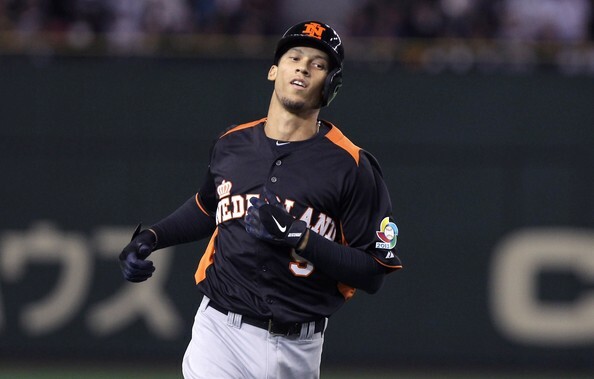 Braves infielder Andrelton Simmons has shown his power playing for the Netherlands. Pool One of the Second Round was played in the Tokyo Dome. Heading into it, I predicted Japan and the Netherlands to advance. Unlike my luck predicting March Madness basketball games, I am doing pretty fairly with my recent WBC predictions. The best game played was probably Netherlands/Cuba. In the bottom of the ninth, with the score tied at six apiece, Kalian Sams hit a sacrifice fly to score Andruw Jones from third, to give the Dutch the win. The Netherlands have definitely become my favorite team to watch this year, due to their prospects like Sams and Xander Bogaerts. Japan has been boringly good all tournament. Probably the oldest team to make the Championship Round, Japan has scored a ton of runs so far, thanks to veterans like Hisayoshi Chono and Kazuo Matsui. Japan has won both previous Classics, and I wouldn’t be very surprised if they won again in 2013. Despite not having neither Ichiro Suzuki nor Yu Darvish, Japan has once again shown how great quality of baseball players they have. Pool Two of the Second Round was played in front of great crowds at Marlins Park in Miami, Florida. Prior to the round, I figured the U.S. and the Dominican Republic would advance. After all, these two teams had the most MLB players in the tournament. After these two teams both picked up wins the first games, my prediction was looking pretty good. However, I didn’t expect Puerto Rico to put up such a strong showing. Puerto Rico advanced to the Championship Round thanks to two one-run wins over Italy and the United States. The Dominican Republic was 3-0 in the Second Round, continuing their undefeated streak. As expected, the Dominican Republic has been pretty much untouchable. Even though their offense hasn’t clicked on all levels but a few times, the D.R. pitching staff has been a pleasant surprise. Led by Wandy Rodriguez (who shutout Puerto Rico in six innings) and Pedro Strop and Fernando Rodney pitching out of the bullpen, the D.R. has had fantastic pitching pretty much all tournament. The Championship Round is sure to be amazing. The first game is Sunday the 17th at AT&T Park in San Francisco. Puerto Rico will take on Japan, and the Netherlands and the Dominican Republic will play the following day. At this point, I see Japan and the D.R. playing for the Championship, and the Dominican Republic squeaking out a win to break Japan’s streak. However, as this whole tournament proves to us over and over again, anything can happen in the world of international baseball. 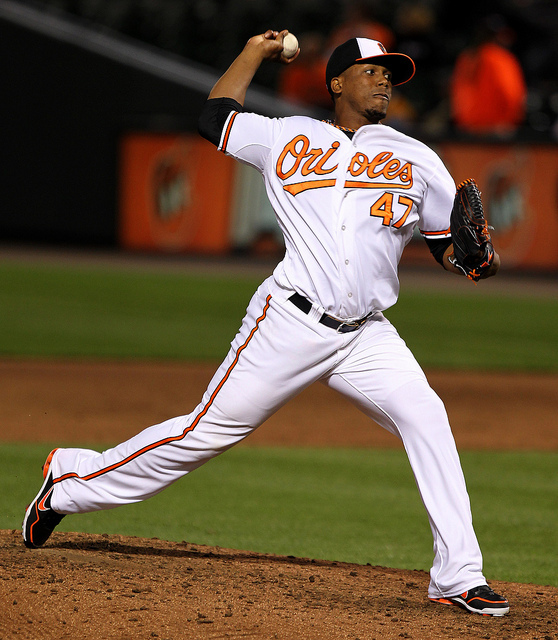 Pedro Strop has starred for the Dominican Republic in the 2013 WBC. Posted on March 17, 2013, in The Rest: Everything Baseball, World Baseball Classic and tagged @rja206, andruw jones, at&t park, dominican republic cmb, dominican republic wbc, fernando rodney, japan baseball, japan wbc 2013, japan world baseball classic, kalian sams, mlbreports, netherlands prospects, netherlands wbcc, pedro strop, puerto rico cmb, puerto rico wbc, sam evans, tokyo dome, uba wbc, USA WBC, wandy rodriguez, wbc 2013, world baseball classic, xander bogaerts. Bookmark the permalink. Leave a comment.